Remember the ice bucket challenge videos from a few years back? Well, kick back and get ready to get your groove on, because the latest viral online challenge will have you dancing at your computer! Police lip sync videos are all the rage right now, and they'll be sure to put the biggest smile on your face. It all started with one police officer lip-syncing to a song in his car. Officers in his department had been asked to share uplifting videos that the department could share on its social media platforms like Facebook. One officer decided to make a lip sync video, and once it was shared online, it quickly went viral. And now police departments all across the country have responded with their own videos of themselves singing! And the stakes keep getting higher! Each department keeps raising the production value to show the world that they've got what it takes! This new viral trend can't help but put a smile on people's faces. And how wonderful that these uplifting video police battles are showing these officers in such a fun way. What a great reminder that we're all human and we all share that goofy side, no matter what our jobs are! Columbus Police Department's video is no normal lip sync. These officers in Indiana decided to enlist the help of Nascar driver Tony Stewart to pull off an epic lip dub! The entire video is an elaborate production starting with Tony flying down the highway before being pulled over. From there, it only gets better as more members of the police department are shown and a medley of songs are used. 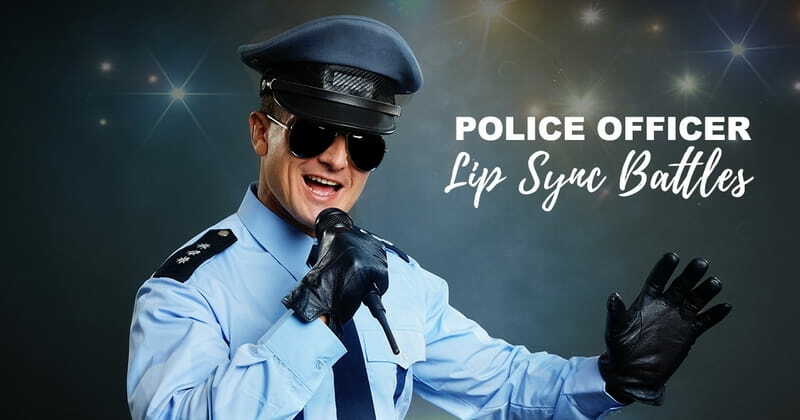 It’s obvious that the Columbus Police Department took this challenge very seriously, and they put a lot of time and effort into making sure this lip sync was top notch. The best part is that everyone looks like they’re having a great time throughout the entire number. Every department is really taking the time to make sure that these lip syncs are entertaining and I am definitely enjoying each one. Do you have a favorite so far? The Sherman, Texas Police Department got in on the lip sync challenge with a video of their own and it’s gone completely viral. This department truly put a lot of effort into this lip sync at a local donut shop. That’s where they performed an incredible rendition of ‘You’ve Lost That Loving Feeling’ made popular in the film Top Gun. There is so much personality and energy throughout this whole number that I caught myself singing and swaying along. This is definitely one of those songs that gets in your head. I just love how much work and effort they put into this lip sync. The Sherman, Texas Police Department is making sure that their video makes an impression. I know this must’ve taken a lot of work and practice to set this all up, but they pulled it off perfectly. It looks so natural and easy and it’s obvious everyone is having a great time. Who else is looking forward to seeing more videos like this? It definitely put a smile on my face for the day. The Norfolk Police Department was challenged by the Corinth Police Department in Texas to record their own lip sync and it’s gone completely viral. This department truly pulled out all the stops for this one and it’s absolutely hilarious to watch. And can you believe that they did this all in one take? Just watch as they travel all over the station as more and more people join in on this lip sync to Bruno Mars’ hit ‘Uptown Funk.’ There is so much personality and energy throughout this whole number that I caught myself singing and swaying along. Then, just when I thought it couldn’t get any better, the whole crew went outside for an epic finale. I know this must’ve taken a lot of work and practice to set this all up, but they pulled it off perfectly. It looks so natural and easy for all of these men and women and it’s obvious everyone is having a great time. The Norfolk Police Department challenged a few other places, so I’m excited to see more of these funny, entertaining, and often inspiring lip syncs. Who else is looking forward to seeing more videos like this? It definitely put a smile on my face for the day. The talented Corinth Police Department in Mississippi tackle the lip-sync challenge, and they definitely pulled out all the stops. This department didn’t just cover one song, they covered a whole medley of popular hits. And the entire video was an elaborate production. There was even a storyline that kicked off the entire lip sync. The force travels all over their county to hilariously sing to some of our favorite songs. And it all comes to an epic ending at the courthouse with a ‘prisoner’ entering the room. It’s obvious that the Corinth Police Department took this challenge very seriously and they put a lot of time and effort into making sure this lip sync was top notch. I can tell that everyone is having a great time and that attitude is definitely contagious. Who else is looking forward to seeing more videos like this? It definitely put a smile on my face. Here’s a very special lip sync from Chief Hepler and his K9 Fox from The Hollywood, Alabama Police Department. These two decided to lip sync to MercyMe’s hit song ‘I Can Only Imagine.’ Together, this police officer and his dog belt out this powerful tune and it’s absolutely amazing. This is the first faith-based lip sync that I have seen so far. A lot of these videos are elaborate productions filled with special effects and lots of people. But this stripped down lip sync truly makes you listen to the lyrics and be filled with the spirit of the Lord. I just love when the officer gets down on his knees and raises his hands to the Lord in Heaven. What an amazing display of faith and devotion to our God. I definitely think this lip sync is my favorite one yet and I hope it continues to be shared. What an amazing moment to watch this officer put his faith out there for the whole world to see with his K9, Fox. Can I get an, ‘Amen!’? Richmond Virginia Police and Fire Department Lip Sync Battle - "Brave"
Richmond Virginia's Police Department entered the lip sync challenge arena with a beautiful video about community engagement and empowerment! At the beginning, we see a female recruitment officer speaking to a room of people including two young girls who are listening intently and 'morph' into two police officers. That’s when the scene changes and we start to hear the beat of Sara Bareilles’ powerfully inspirational anthem, ‘Brave’ begin to play. Then, as each scene changes, we get an inside look at the department and all of the women on the force. We even get to see other groups such as the fire department and Richmond Ambulance Authority. Then, the video peaks with different people of all ages gathered together to dance to this inspiring song. This is such a great message to all of the young girls around the world that they can be whatever they want to be when they grow up! While many of these police lip-sync challenge videos are fun and carefree, some departments are taking this challenge a step further. That’s exactly what is going on with the Pickens County Georgia Sheriff's Office lip sync. The officers decided to use this opportunity to shed light on the issue of domestic abuse. The video starts out like all the others with the police department dancing and singing along to a fun song. But shortly after, the tone changes and a powerful message is sent. Sadly, domestic violence is something that our police officers have to deal with on a regular basis. But this department is hoping that their video will bring awareness to this terrifying issue. I’m so proud of the Pickens Country Georgia Sheriff’s Office for using this opportunity for a bigger purpose. No wonder everyone is talking about this lip sync challenge. It’s been viewed over 10 million times on social media and that number is growing. What did you think of these police lip dubs? We loved that the officers started to use the platform to showcase some powerful messages!